“Pádraic Ó Conaire“. Via Vicipéid. 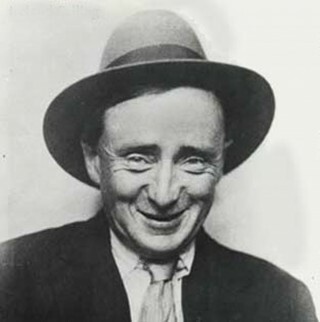 Ó Conaire, Pádraic (1882–1928), novelist and short-story writer, was born 28 February 1882 in the ‘Lobster Pot Bar’ in Galway city, one of five children of Tomás Ó Conaire, publican, and his wife Cáit (née Ní Dhonncha). Much folklore surrounds Pádraic’s life and his biographers have encountered difficulty in establishing certain facts about him. Although both his parents spoke Irish, he was brought up speaking English. His father left the family for America in 1888 and died either during the journey there or shortly afterwards. Pádraic began school at the age of three in the Presentation convent, Galway. Four years later he entered St Joseph’s CBS, also in the city. On his mother’s death (1894) both he and his two younger brothers went to live with their grandparents and bachelor uncle in Ros Muc, Co. Galway. It is unclear whether Pádraic attended the national school in Ros Muc or Eanach Mheáin, Co. Galway. It appears that he did not spend all of the period 1894–8 in Ros Muc, as both he and his brothers were sent to live with their maternal aunts in Co. Clare after the death of their grandmother in May 1896. They attended school in Milltown Malbay, Co. Clare, and also in Rinneen, Co. Clare. He began attending Rockwell College in January 1898 and when the juniorate there closed in August of that year he moved to Blackrock College, Dublin, where he was in the same class as Éamon de Valera (qv) and Thomas Francis O’Rahilly (qv). His interest in literature was first sparked by his Irish teacher, Tadhg Ó Donnchadha (qv) (‘Torna’). He was asked to leave the school in July 1899 without having completed the intermediate certificate examination (senior grade) but it is not known for what reason. In January 1900 he moved to London, where he entered the civil service as a ‘boy copyist’ with the education board. He graduated to assistant clerk a year later and remained in the post until 9 October 1915, when he was dismissed; it is not known why, but it appears that he had been planning to return to Ireland at least two years prior to that. During his time in London he was active in the Irish-language movement and taught classes for Conradh na Gaeilge in Bermondsey, Bishopsgate, Clapham, Fulham, and Vauxhall. By 1902 he was involved in the organisation of the Conradh and in 1915 was elected to the organisation’s Coiste Gnó. He became active in the Irish Volunteers in 1914 and, together with Michael Collins (qv), was a member of Company no. 1 in London. He may also have been involved in the IRB, particularly as many of his acquaintances, both in Ireland and in England, were in the organisation, but this cannot be established with certainty. There is no evidence that he took any active part in the organisation on his return to Ireland in 1915. Through his involvement in Conradh na Gaeilge he came into contact with a number of people interested in promoting the language, including the writer Liam P. Ó Riain and the poet Tomás Ó Buí, and through their influence he began to write in Irish. His interest was also sparked in continental literature, particularly the Russian authors, and he began reading the works of Gogol, Gorki, Tolstoy, and Turgenev. He is considered a pioneer in the development of modern Irish literature and of literary criticism in the Irish language, and the influence of continental authors is reflected in his work. His award-winning essay ‘Seanlitríocht na hÉireann agus nualitríocht na hEorpa’ (1908) argued that the plight of the individual was at the centre of modern literature. Common themes occurring in his work are isolation, conflict between good and evil, the tragedy of life, hatred, blindness, despair, and madness. Many of his characters are spectators on the edge of society, symbolised by their looking through a window. During the period 1901–27 he published over 400 short stories in various newspapers and journals including Inis Fáil, An t-Éireannach, Guth na nGaedheal, United Irishman, New Ireland, Weekly Freeman, Leinster Leader, Irish Nation, Irishman, Freeman’s Journal, Free State, Galway Express, An t-Óglach, and Fáinne an Lae. He also wrote five plays, a novel and over 200 essays on various topics. His first publication, a short story entitled ‘An tIascaire agus an File’, was published in An Claidheamh Soluis (14 December 1901). His best-known works include Nóra Mharcais Bhig agus sgéalta eile (1909); Deoraidheacht (1910); An Chéad Chloch (1914); Seacht mbuaidh an Éirghe amach (1918); An crann géagach (1919); Síol Éabha (1922), and M’asal beag dubh (n.d). Twelve of his rural sketches, translated by Cormac Breathnach (qv) and illustrated by Mícheál MacLiammóir (qv) were published under the title Field and fair (1929) and another fifteen appeared as Pádraic Ó Conaire (1982). A collection of his short stories were published by Tomás de Bhaldraithe (qv) as Scothscéalta in 1956. In April 1917 a number of his works were at the centre of controversy between Douglas Hyde (qv), professor of Modern Irish in UCD, and Fr Peadar Ó Laoghaire (qv), who complained to the registrar of the NUI about the presence of Deoraidheacht on the matriculation syllabus and Nóra Mharcuis Bhig and An Chéad Chloch on Hyde’s university course. In 1917 Deoraidheacht had replaced Ó Laoghaire’s Séadna (1904), which had been on the matriculation course from 1913 to 1916. Ó Laoghaire objected to the subject matter of the works, which dealt with issues such as adultery, prostitution, and alcoholism. As a result of the controversy, Nóra Mharcuis Bhig and Deoraidheacht were replaced by Iosagáin, by Patrick Pearse (qv). Ó Conaire won a number of Oireachtas na Gaeilge literary awards for his work: between 1904 and 1913 he won five prizes in the short-story competition, one in the novel competition for Deoraidheacht, two prizes in the drama competition, and two prizes in the literary essay competition. On his return to Ireland in 1915 he was employed by Conradh na Gaeilge as a timire (organiser), travelling around the country promoting the Irish language. He continued to write but is generally considered to have composed the best of his work while in England. He spent the final years of his life primarily in Galway city and county, teaching Irish and drinking heavily. He died destitute in the Richmond Hospital, Dublin, on 6 October 1928. In 1935 Éamon de Valera unveiled a statue of Ó Conaire by Albert Power (qv) in Eyre Square, Galway (latterly in the Galway city museum). On the centenary of Ó Conaire’s birth in 1982, Máirtín Ó Direáin (qv) unveiled a plaque on his grave in Bohermore cemetery, Galway. During Ó Conaire’s time in London he began living with Mary McManus. The couple had three daughters and one son, although it is unclear whether they ever married. After Pádraic returned to Ireland, Mary remained with their children in London, where she died in 1945. “Pádraic Ó Conaire”. Via Vicipéid.